Factory Sealed 2018 Panini Limited Football Hobby Box mit 3 Packs Per Box, 5 Cards Per Pack. 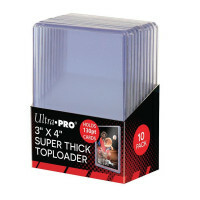 In jeder Box: 2 Autogramme und 1 Memorabilia Card im Durchschnitt ! 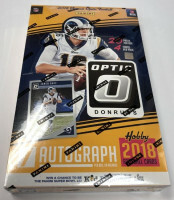 Produktinformationen "2018 Panini Limited Football Hobby Box NFL"
Find One On-Card Rookie Patch Autograph Per Box! On average, find one Rookie Patch Autograph per box! Some of the most promising newcomers are on display with variations that parallel all the way down to 1-of-1! Find Partnership Duals & Trios autographs from some of the best tandems in the NFL! Celebrate one of the biggest moments in an NFL player's career with Draft Day Signature Booklets! These autographed booklets contain a swatch of the jersey they held on stage the night they were chosen at the 2018 NFL Draft! Search for the Six Star Signature Booklet inserts, featuring some of the best players from their respective franchises including the Dallas Cowboys & Green Bay Packers! ROOKIE PHENOMS: Find a group of promising NFL rookies in this jumbo memorabilia set! DRAFT DAY SIGNATURE BOOKLET SAPPHIRE SPOTLIGHT SWOOSH: Draft Day Signature Booklet features a true piece of NFL history! 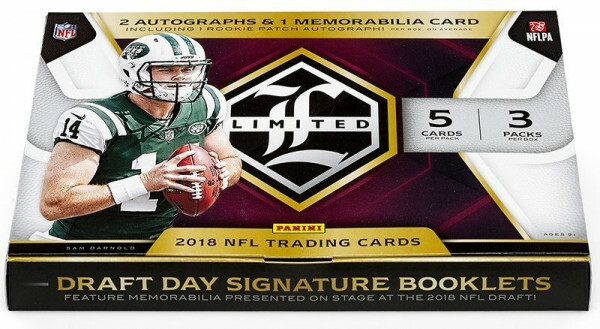 These booklets feature a swatch of the jersey that the player held on stage at the 2018 NFL Draft! UNLIMITED SIGNATURES: Unlimited Signatures is loaded with autographs from legends and current NFL stars. Search for short-printed autographs like Joe Montana & Matt Ryan! SIX STAR SIGNATURE BOOKLET: Find the stunning Six Star Signature Booklets that celebrate players from throughout a franchise's history! These showstopping booklets showcase players from the past, present and future! Weiterführende Links zu "2018 Panini Limited Football Hobby Box NFL"
Fanbewertungen für "2018 Panini Limited Football Hobby Box NFL"